Changes to fast-fashion supply chains are part of the sustainable revolution. Recent trends and events continue to call for a fashion revolution. We need to move the fashion industry away from the take-make-dispose consumption of clothes that are often produced in inhumane conditions and affect the environment in more damaging ways than most people realize. 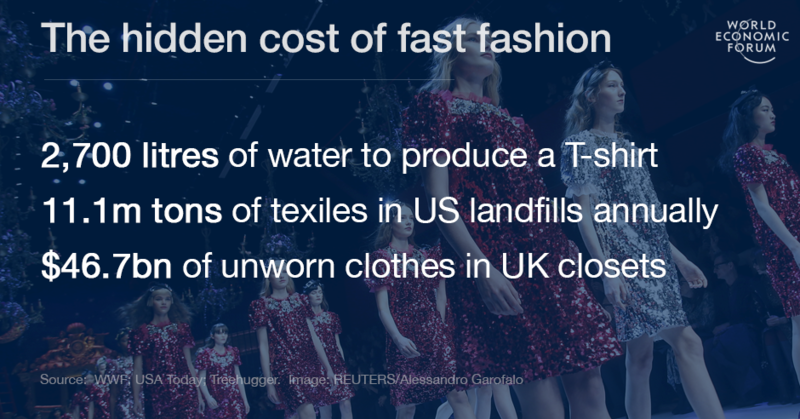 This issue has been described in previous Agenda blogposts on the hidden costs of the fashion industry and, specifically, the environmental costs of fast fashion. We need bottom-up action and solutions, developed with a next generation mentality, featuring tangible examples and actionable plans. We have identified five ways pioneers are creating sustainable change and presenting promising new ways of thinking that are disrupting the fashion industry. Several pioneers are focusing on empowering consumers to make more sustainable fashion choices. To spur such behaviour, it is essential to make it personal and human. Do not forget why people buy clothing: for validation, for recognition and to express their identity. By giving them access to knowledge and a number of options, customers can develop critical thinking for conscious and well-informed purchasing decisions. Examples include Good On You app, which revalues your closet and its contents, allowing for comparing brands and engaging on sustainability; and Rent the Runway, which taps into a luxury sharing economy, allowing customers to rent designer dresses for a fraction of the retail price. Interestingly, the latter start-up has recently received a $20 million investment from Alibaba founder Jack Ma, which indicates its promise. A master’s degree in circular fashion entrepreneurship at the Amsterdam Fashion Institute. In collaboration with the Dutch social enterprise Circle Economy and Fashion for Good, this forthcoming course will teach students to start a fashion business while considering social and environmental values. Centre for Sustainable Fashion. This research centre at the University of the Arts London, based at London College of Fashion, has its 10-year anniversary this year. That’s a decade of using fashion to instigate behavioural change and build a more sustainable future. Youth Fashion Summit. This is a partnership between UN Global Compact and the Global Fashion Agenda in which students are challenged over a two-year programme to design a framework for sustainable fashion to contribute to Sustainable Development Goals 3 and 5. As during any systemic change, there are many pioneering initiatives in the fashion industry that stimulate collaboration on sustainability challenges. Stakeholders are breaking boundaries that belong to the old take-make-dispose version of the industry – for example, when brands collaborate with partners in their value chains. They share with and learn from each other by using the same tools for measuring sustainability or social and environmental impacts. They aim to play by the same rulebook and use “one common language”, with a focus on comparability, progression over time and preventing repetition. Some pioneering initiatives that spur collaboration at scale are: Shaping Fashion, a project to bring together the Global Shapers and Fashion Revolution networks to address local/regional issues in the fashion industry and amplify impact through a global campaign; and the Sustainable Apparel Coalition, which unites all players in the value chain to identify and measure sustainability performance on a large scale. The Zero Discharge of Hazardous Chemicals “Roadmap to Zero” programme, meanwhile, connects the textile, leather and footwear industry to eliminate the use of hazardous chemicals. Fashion for Good. This global platform’s accelerator programme has supported many innovative initiatives, such as: SpinDye, offering a clean and traceable colouring method for textiles; LiteHide by LeatherTeq, a technology to prevent the use of salt for preservation of hides in leather making; Pili Bio, which makes organic dyes from microorganisms, and the Agraloop, which collects food crop waste and turns it into fibres that can be used in textiles. Circular Fashion Games. In this bootcamp programme, interdisciplinary teams work on circular innovations for the fashion industry. One solution produced was a digital tool for fibre company Lenzing to inform designers who use their textiles about circular choices. Fibersort. This technology automatically organizes large volumes of mixed post-consumer textiles by fibre type. It provides textile recyclers with reliable and consistent material input, thereby preventing large amounts of waste. Dyneema. This strong, lightweight fibre can enhance the durability and performance of apparel to ensure a longer lifetime. A fourth realm of innovation is in fashion industry transparency. The key question is: how do we apply transparency as a tool for change? Stakeholders want to prevent exhaustive transparency efforts without a positive impact on the real world. What is required is transparency with intent, whereby players have access to and comprehension of information for a more sustainable and trusted value chain. Examples of transparency initiatives include: A Transparent Company, a start-up applying blockchain technology to create value chain transparency; the Fashion Transparency Index, for which, every year, Fashion Revolution ranks 150 of the largest brands on the extent to which they disclose information on social and environmental practices; and EON-ID, which uses the internet of things to connect an item of clothing to all steps in the value chain and provide the information required to foster sustainable innovation. Enschede Textielstad. This initiative is reviving weaving in the city of Enschede, the Netherlands. They use old looms and recycled textiles but in new ways, offering circular textile solutions. Mycotex. This mushroom-based textile can be grown into custom-fitted moulds. The technology prevents large amounts of landfill, is fully biodegradable and even has potential benefits in terms of skin-caring features. Diamond Foundry. These man-made diamonds are produced through reactor plasma technology, without the environmental or human harm involved in conventionally mined diamonds. Bolt Threads. This company creates bio-fabricated silk by mimicking spider silk production, and a leather-like material based on mycelium, the vegetative component of mushrooms. Craftsmanship in Iloilo. A start-up in the Philippines’ former textile capital is working on creating a directory for mananahi, or local dressmakers. All in all, these are exciting times for the fashion industry. The fashion revolution is well underway, and every day we see new pioneers being born. Keep an eye out for them: before you know it, sustainable fashion will no longer be just a trend but the new normal.